In 1866, a new Seminary Building (now Presidents Hall) was constructed. A new college building followed soon after. These engravings give us a picture of the campus in 1869. From the left, the College Building, the Seminary, the Chapel. The first thing we notice in this engraving is that there is a bell tower on the the original facade of the Chapel. Examining the picture closely, we can see that there is no front entrance and no connecting passageway to the Seminary (Presidents Hall). The College Building on the left was damaged by fire in 1886 and again, in 1909. Its lower portion remains as Stafford Hall. Marshall Hall, erected in 1898 adjacent to Presidents Hall as the College Library, which today houses administrative offices, is not in this engraving. 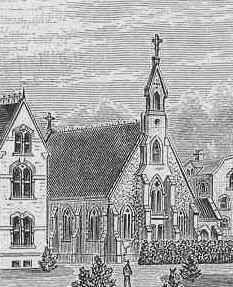 This woodcut more clearly shows shows details of the Chapel in its early years. A rear view of the Seminary and College Buildings in 1869. The story of the development of the Chapel principally relies on photographic evidence. Records of the construction and design, as well as many of the subsequent renovations, have been lost over the years, probably in the fires of 1866, 1886, and 1909. The earliest known photograph of Seton Hall shows the Chapel and the Seminary building. Although trees obscure the Chapel, it is clear that the bell tower is empty, as is the niche below it. The side entrance is clearly in view. The Chapel was built without a sacristy. The sacristy is an area where vestments and liturgical appointments are stored, and where the priest and other ministers vest for Mass. The 1875 photograph shows the rear of the Chapel and it is evident, upon close examination, that the sacristy was not yet built at this time.